I saw a segment on the news in the U.K. about how it is not just female actors who feel more and more that they need to be in peak physical shape to get good roles but also male actors. The whole point of the segment was to convey the non-intuitive somewhat shocking message that it isn't just women who feel pressured to look good. It made me laugh a bit because of course male actors are just as conscious of body image as are woman actors. 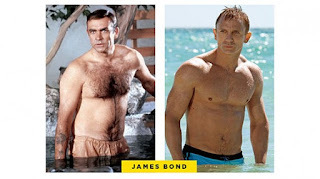 They did a comparison of James Bond as portrayed by Daniel Craig vs. Sean Connery. Craig, if you did not know, is way more in shape than Connery ever was. There is a currently popular so called fat acceptance movement. No doubt due to the our expanding collective waistlines. But if you think about it is there really any difference between being in good physical shape and say, being well groomed? In the Craig vs. Connery example, it was stated that the attractiveness of men used to be more about how confident they were and how they carried themselves rather than how ripped they were. So does than mean that we are prejudiced against men who are less confident? What about other factors such as height or tone of voice? Would a shy, short, fat, bald man who stutters ever be selected to play James Bond? I think not despite the fact that a person has no control over any of those factors. And even for factors that one has control over such as grooming, or indeed physical fitness, do they really reflect a person's worth? No, they do not. But let's not get to hung up on the matter. It is all about context. I have had and have many friends and work colleges who are of varying girth, height, or other physical characteristic as well as varying levels of self-confidence and even emotional stability. It doesn't really matter all that much. But I admit that when it comes to romantic relationships, it does matter. There are people who I would not go out with because of how they look and/or act. I think everyone is that that way. Maybe that is why successful relationships occur more often between people who are the same category. Not just physically but intellectually, emotionally and ethically as well.